← Lost – Where’s Syd ? 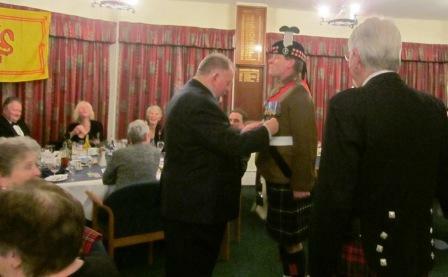 Senlac don’t just pay the piper – they give him a medal! As you know ‘Anything’ is always on the look-out for the weird, the wacky, and the touching. In a world of rather posh Rotary, I love the personal touch from many of the clubs in District 1120. And in their own discreet way….! they do not disappoint. As I have hinted in the Facebook comment connected to this story I find RC Senlac one of the most interesting clubs in ‘my manor’. They have members from three boroughs in East Sussex, (despite Rotary competition from all 3), and have a stoically individual sense of purpose. Perhaps best illustrated by their ‘Yellowmen’ project in up-country Kenya which they continue – (pause) without TRF assistance. 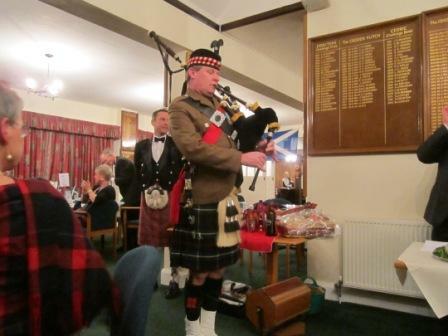 At this Burns Night Supper, which was in the Cooden Golf Club – ooh, watch out RC B-o-S! they had a full house. Current President Jimmy Carroll ‘called for the Malts’ (I say – what’s that? – Ed.) served by Eddie McCall, and Iain Robinson – no need to investigate their provenance! IPP Bob Wren, gave the ‘Address to the Haggis’, & John Relfe – gave the toast to the ‘Immortal Memory’. This was followed by a ‘toast to the lassies’ – then an ode from the lassies!, followed by a Scottish themed raffle. Oh, and somewhere in between, they snarfed a plateful of the eponymous, with neaps, and tatties – that’s ‘swede & potatoes’ to you and me. But the piper, ‘Anything’ – what did they do for the piper? I was coming to that…. the piper is one Jon Bartholemew, ‘Piper in Residence’, and for him they had something rather special – A Senlac Rotary award (alas! No picture). Do I need to say what a good time they had all had? No, but will a possible separatist Scotland make it more, or less exotic than it clearly already is! This entry was posted in Rotary Club Senlac and tagged Rc of Senlac. Bookmark the permalink.